Magister Robert J. Johnson is a man of (some) wealth and (lots of) taste. He created Old Nick Magazine for the forgotten man… the man who longs for the time of the genuine gentleman with a dark bent. The sophisticate who demonstrates manners and grace in every circumstance whether he’s at a formal affair or a ball game, for the man who opens doors for women, who prefers wine to beer and may not always order one, but knows what ingredients make up a fine, dry martini, for the man who loves women with curves, and who feel, smell and act like women. He welcomes all who are rogues, libertines and voluptuaries at heart. 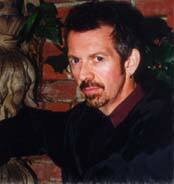 Bob Johnson is also the author of the books The Occult Investigator and Corporate Magick. You can find all Gothic.net articles and fiction relating to Bob Johnson at tag Bob Johnson. Posted by Gothic.net on Tuesday, January 18th, 2011. Filed under Who's Who. You can follow any responses to this entry through the RSS 2.0. You can skip to the end and leave a response. Pinging is currently not allowed.